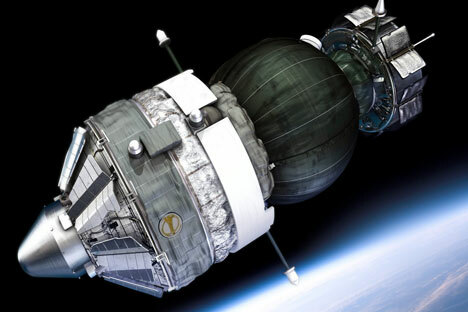 Russian scientists believe the theory that life originated in space was proven by the experiment involving the Foton-M #4 satellite, which returned from orbit in November 2014. In the second half of November scientists announced that their experiment proved the possibility of life being brought to Earth by meteorites traveling from space. Alexander Slobodkin, a collaborator at the Institute of Microbiology at the Russian Academy of Sciences (RAS), stated that it was the return of the Foton-M #4 satellite that confirmed the theory. It turned out that some forms of thermophilic bacteria can survive on a meteorite's surface if it travels through compact atmospheric layers. Representatives from the RAS Medical Biological Institute say that the thermophile lives in hot objects similar to the thermal springs of Kamchatka. An active sludge develops there when the temperature is above 100 degrees Celsius. In the course of the Foton-M experiment only bacteria that had three out of 24 cells placed on the surface of the apparatus survived. "These are just a few cells, not even in the hundreds," said Slobodkin. A year earlier when the Bion M1 satellite was launched, another bacteria survived in space, the Bacillus pumilus. Are bacteria consuming the International Space Station? Finding themselves in a culture medium on Earth, Foton-M bacteria began to multiply. However, this fact should not be considered as complete proof that the theory is correct. The apparatus with the bacteria travelled at an altitude of only 575 kilometers. Had it been possible to lift it higher, the conditions would have been different and the radiation's effect would have been stronger. "It is difficult to say if the microorganisms would have survived in these conditions," notes Mikhail Panasyuk, director of the Nuclear Physics Institute at the Moscow State University. "But today we cannot confirm as fact that cosmic radiation will kill everything alive in space." At this stage scientists at the Russian Academy of Sciences have been able to refute two theories: that live organisms do not survive in open space and that when a meteorite falls to Earth all microorganisms burn. Of course, the latter confirmation needs more precision. Victor Grokhovsky, a member of the RAS Meteorite Committee, is convinced that not a single microorganism is capable of surviving on the surface of a celestial body when it enters compact atmospheric layers as 90 percent of its body is completely burned. Grokhovsky is convinced that the theory's proof should be looked for not on the celestial body's surface, but in its depths. Bacteria have already proven that they can adapt to the life conditions on space stations. On Earth they behave in a relatively mild way. But having found themselves in the atmosphere of a space station, the bacteria were forced to adapt to a new habitat and "consume" any metallic surface. Earlier the Russian Federal Space Agency confirmed that on the International Space Station's surface there were microorganisms that remained after the assembly and launching of the module into space. This was confirmed by the TEST program's analyses. Bacteria in the form of DNA fragments from a heterotrophic marine bacterioplankton inhabiting the Barents Sea were found in four out of 11 tests. All tests demonstrated an absence of highly toxic rocket fuel. Scientists say that the appearance of plankton traces from the sea is due to the fact that at an altitude of 40-70 kilometers significant amounts of cosmic dust are formed. The dust contains biogenic substances and microorganisms, which were sent up by rising air currents. There is even a theory that not all microorganisms there originated on Earth. Confirming or refuting this theory is still not possible because scientists have not studied all bacteria found on Earth. "The question of how life began on Earth is of a fundamental nature and does not have a proper response," says Ivan Moiseev, director of the Institute of Space Policy. "We just don't know. The hypothesis of life having origins in space was created a while ago and it doesn't really say anything. It is popular due to its simplicity. Where is life from? From space, and that's it, the issue is closed." Moiseev believes that the RAS Microbiology Institute's finding does not mean that life was brought to Earth by meteorites. The expert reminds us that cosmic space is filled with galactic space radiation. These are kernels of heavy elements with lots of energy that can penetrate just about any obstacle. The interactivity of these kernels with a complex molecule leads to its destruction. "If we presuppose that the meteorite has not come from the Solar System, then it would have flown for a million years exposed to galactic space radiation," underlines Moiseev. "Complex molecules cannot survive this kind of exposure, not to mention protein organisms." Moiseev reminds us that there is a theory that meteorites brought life to Earth from Mars. There are assumptions that meteorites could have been the result of volcanic activity on the Red Planet in the past. But then another contradiction arises. If the meteorite had originated on Mars, it would have been subjected to very high temperatures twice: when it “set off” and when entering the Earth's atmosphere. "The preservation of life in these conditions is impossible," says Moiseev. "And the possibility of life having originated on Mars is much less than on Earth." However, the Martian theory has another twist. At the beginning of August 2014 representatives of the Swiss Federal Institute of Technology in Lausanne published a study of the traces of organic carbon in a Martian meteorite. They found that the possibility of a biological origin of these traces was rather high. The carbon could have been preserved in the rock's cracks. The meteorite itself could have splintered from the surface of the Red Planet after an asteroid attack and following a long space journey could have found itself on Earth.